I’m going to be 43 this month, and yesterday I bought reading glasses for the first time. Apparently this is very predictable behavior, and exactly the age one’s eyes are supposed to stop working. Sigh. I bought the glasses so I could get on with a paperback copy of Dostoyevsky’s Brothers Karamazov, which has the most fiendishly small cramped letters I have every seen. I suppose I could have just bought another copy of the book, but it’s not just this paperback. It’s other books, too, anything with small print…particularly at the end of the day. It’s time I faced a fact that is right in front of my face – literally, because I have to hold it very close or I can’t see it. I’m making slow progress with The Bros. Karamazov, but I’m enjoying it so much. I love to read novels in which the characters think so deeply and question everything – their lives, their souls their place in the world and society – to such an extent that this becomes a huge part of the drama. Levin’s musings at the end of Anna Karenina make me weepy! His story should be over, if you take it plot point by plot point, but there’s so much he doesn’t understand! When I was little I used to think about things in this way (at least that’s how I remember it). I used to try to figure it all out, and understand how I fit in with everything, and get all confused, and then have little flashes of clarity where certain things made sense. And then I’d heat up some frozen french fries and pore over a Tintin. I was a weird kid!! At some point I stopped thinking about it so much…everything goes so fast you get swept along, hour to hour, day to day. Maybe it’s better that way…there’s something to be said for just getting on with your day, getting things done. And we’ll always have Russian novels! And you just know they’re eating beets, because, um, borscht is Russian, right? We got some red beets from our CSA, and then I went to a market and saw some big beautiful golden beets, and I couldn’t resist! So we’ve got beets for weeks. I decided to make a beet tarte tatin. 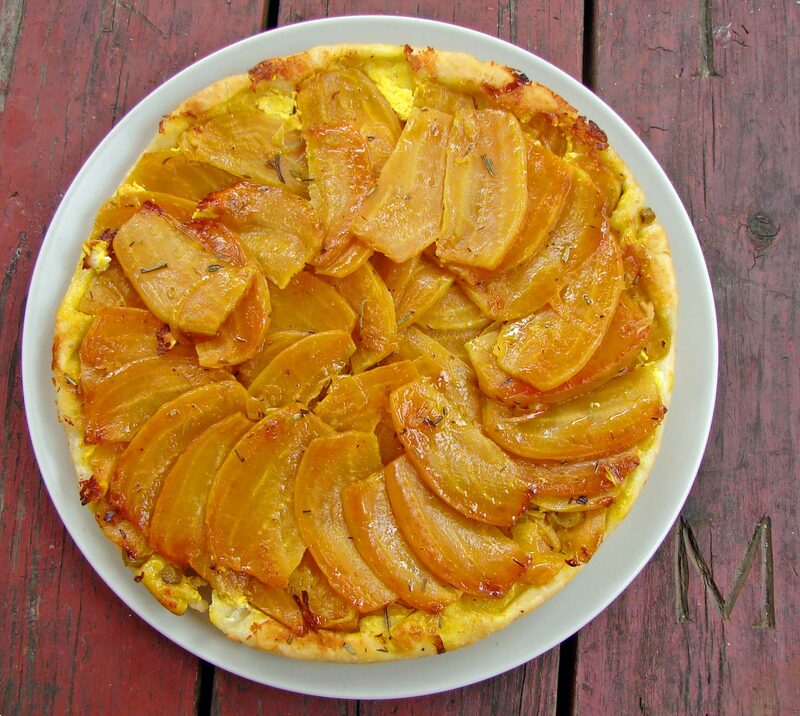 This is an upside-down tart, usually involving apples and caramel. I thought it would be nice to make a savory version with beets, because they’re so sweet that they seem to form their own caramel when you cook them. (I’ve tried it in the past with green tomatoes and that turned out well!) I added some balsamic, lemon zest, orange juice and goat cheese – a few tart, bright elements to offset the earthy sweetness of the beets. I think it came out really well! I cooked all the beets, and then I had too many to fit in one layer, so I made two layers. I think, if I had a do over, I’d make one layer of beets, and save the rest to toss with pasta or chop into a salad, because the two layers of beets was very beet-y. Delicious, though, if you like beets!! With a real tarte tatin, you use a skillet to caramelize the apples, then you put the dough right on that and put the whole thing in the oven. I wasn’t sure my skillet could handle it, so I transfered it to a cake pan. If you have a big, oven-proof skillet, though – you’re golden!! 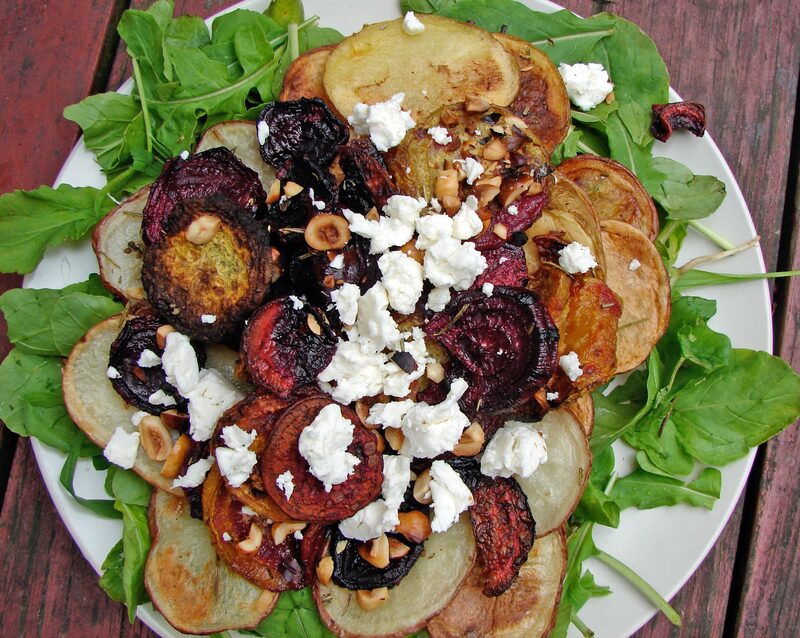 And the other day, I made a nice salad-ish meal with roasted beets and potatoes, sliced thin, and sprinkled with french feta and hazelnuts. The whole assemblage being made upon a bed of arugula. I used a combination of red beets, golden beets, red bliss potatoes and yukon gold potatoes, and it was very pretty indeed!! Here’s The Perfect Beet by Talib Kweli & KRS One. What? What? It’s beat? Ohhhh. These two men think a lot, and tell us all about it. Combine the flour, salt and baking powder. Add the butter, and work with your hands till you have a crumby texture. Stir in the egg. Then add just as much water as you need to make a smooth, workable dough. Knead it for a minute or two, to be sure the egg is well-distributed, and then wrap it up and put it in the fridge for at least half an hour. Peel the beets. Chop their ends off. Cut them in half lengthwise, and then into thin (1/8th-1/4 inch) segments – as if they were apples. Melt the butter in a large frying pan. Add the garlic, shallot, thyme and rosemary. COok until the garlic & shallot start to brown. Add the white wine, vinegar, lenon zest and orange juice. Cook for a minute or two and then add the beets – trying to keep them in a flat layer. Cover the pan, and cook for about 10 minutes, till they’re starting to be soft and translucent, then take the cover off and allow them to cook till the liquid is thick and syrupy. You don’t want the pan to dry out completely, so add a dash of wine or water if it starts to get too dry. Cook until the beets start to brown a little bit – stirring them very carefully. Butter a cake or tart pan. Make a pretty layer of beet slices. If you have beets left over, you can make another layer on top of that, or save them to toss with salad or pasta. Spoon the shallots, garlic, and all the liquid left in the pan over the layer of beets. Crumble the goat cheese on top of that. Roll the dough out to be about 1/2 inch larger than your pan all the way round. Press it over the filling, and press the edges down on all sides. Bake until the crust is browned and puffy. About 1/2 hour. Remove and let it cool for a few minutes. Give it a shake to make sure nothing’s stuck, and then invert it onto a plate. Peel the beets, wash the potatoes. Slice them all into 1/4 inch pieces. Coat them with olive oil, sprinkle them with rosemary and sage, and roast at 425 until they’re browned and crispy on the edges. (Keep the beets and potatoes on separate sheets, because the potatoes will cook more quickly.) Turn them after about ten minutes, to be sure they brown on each side. Let them cool for a minute, and then arrange them on a bed of arugula. Sprinkle french feta and hazelnuts on top, and season with salt and pepper. 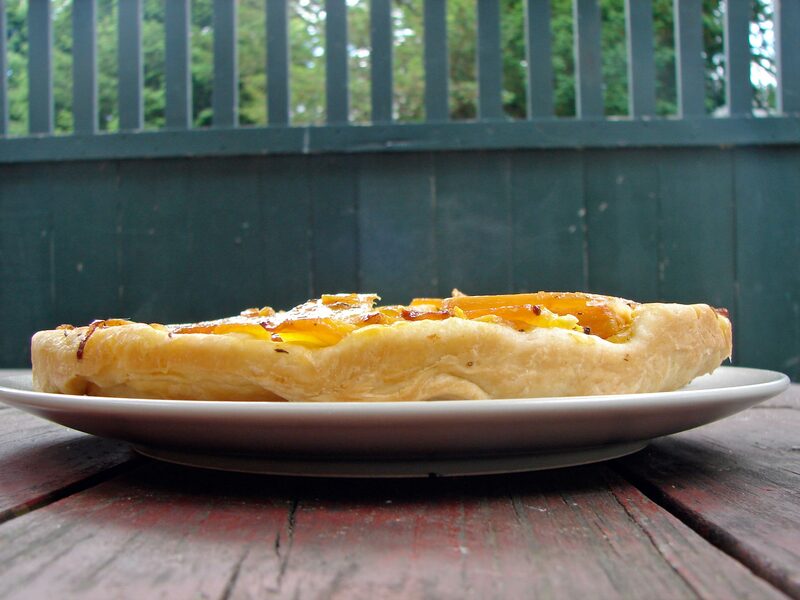 This entry was posted in pie, potatoes, recipe, salad, Uncategorized and tagged beet tarte tatin, beets, goat cheese tarte tatin, roasted beets and potatoes, rosemary, sage, thin-sliced roasted beets, thyme by Claire. Bookmark the permalink. I had a roasted beet and goat cheese salad when I had my fancy diner at the Don Cesar. Seemed appropriate, as Mike had mailed me beets once while we were courting. It was fantastic and I think of it still. I will have to try to make this. He mailed you beets!! That’s so sweet! (Literally!) I think beets and goat cheese are perfect together. Yes, I am definitely pinnalng to put up recipes of the things on our menu! Hopefully it will be one or two new ones per week. Please let me know if anything sounds particularly good! I will definitely photograph the grilled corn recipe tomorrow as I make it since you are interested (well, as long as G and M let me have the time, since we’re having dinner guests) and hopefully will post it next week.